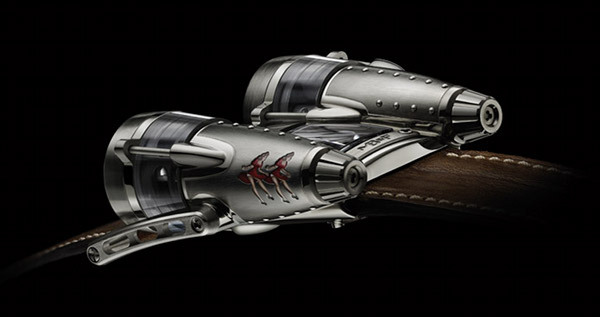 Razzle Dazzle and Double Trouble’s authentic vintage accoutrements adorn a thoroughly modern, state-of-the-art Horological Machine featuring a 311-component, in-house movement developed specifically and exclusively for the Thunderbolt. I was talking about watches for Top Guns not too long ago. And then someone like Maximilian Busser & Friends comes along and outright builds a watch that is a “Top Gun” itself rather than just worn by one. 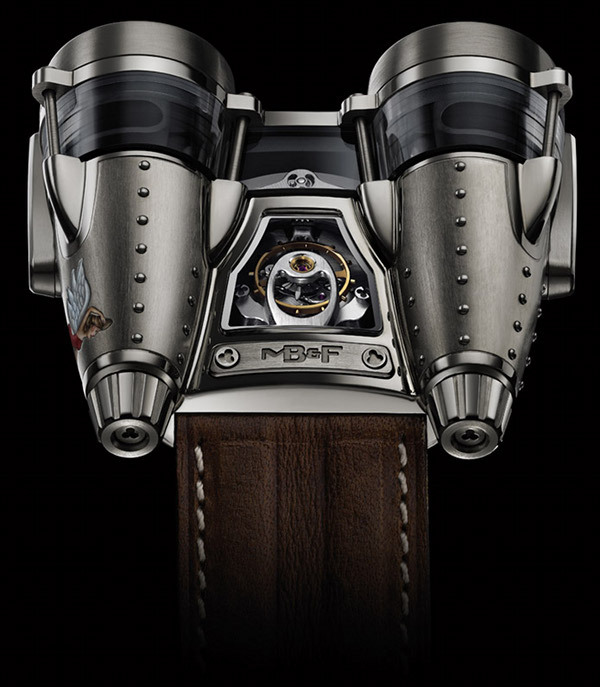 If the original MB&F number four didn’t steal (and own) your gaze this one will. Cold riveted and gripping in part due to the WW2 style “nose art” on the double barreled watch “nose”, the HM4 Razzle Dazzle pays excellent homage and if anything makes subtle assertion of your cavalier attitude towards life and like the cheeky pin ups of yesteryear; probably makes you downright provocative. Historically speaking, though never officially sanctioned, nose art in harsh combat environments were moral boosters and If I were to draw a modern life parallel, if you could afford one of these during this perennial global financial crisis, I’m willing to bet my last dollar that you have been spending 60 hour weeks at the office. Those of you familiar with the original HM4 Thunderbolt would know that paint on titanium isn’t really the most lasting of prints but for Razzle Dazzle and Double Trouble, the titanium fuselage has been machined specially for the design so that when the paint and its protective layers of lacquer are applied there’s minimum risk of it being scratched or damaged. If all this World War 2 authenticity wasn’t enough for you, here’s an answer to what you have been wondering since I mentioned the words “riveted” in paragraph one- Yes, those are real titanium rivets; and those dials? The glow like vintage patina with a special cream-coloured super LumiNova mixed with fine copper particles and the leather straps are recycled from vintage Swiss military bags. The Monsieur’s Brief: When you own a luxury timepiece like this, you better pray you have the personality and charisma to not have a watch (however expensive) steal your thunder. Razzle Dazzle and Double Trouble are ebullient limited editions of eight pieces each.